Welcome to CSS Worksafe - Total Fall Protection. 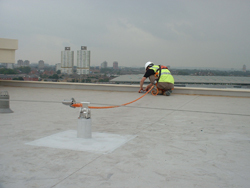 Specialists in Safe Working at Height: Fall Arrest & Fall Prevention. Falls from height are one of the most common forms of accident at work, comprising nearly 20% of all workplace injuries. Every year, falls result in around 5000 cases of major injury and about 80 fatalities, usually from heights above two metres. The construction industry alone accounts for half of these incidents. It is estimated that the annual cost to society of accidents caused by falls is in the region of more than 300 million pounds, primarily in terms of personal suffering, but also including medical costs, costs to employers, lost output and damage to equipment. We at CSS Worksafe are at the forefront of the European industry in fall arrest systems, fall arrest equipment, and fall arrest training and ensuring safe working practices when working at heights. Our horizontal lifeline systems have been used at Chelsea Football Club, Eurotunnel, Buckingham Palace, the new London Docklands Museum to name but a few. 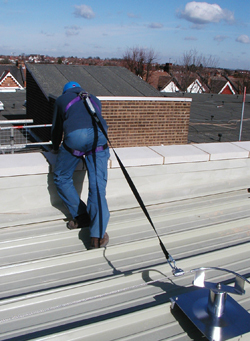 Our lifeline system is unique in that it is able to withstand the imposed load of a fall arrest, but is also designed to accommodate the workers task by minimising hindrance to working procedure and movement. It is available in a range of colours to integrate with the working environment. If you require any information that is not featured on our web site then please do not hesitate to get in touch - you can either use our online feedback form or click here to send us direct e-mail about our fall arrest systems.